I’ve been sitting here “trying” to write for six hours. In those six hours I have: cooked two meals, drank coffee and then tea, watched three episodes of something mindless that I’ve seen before, scribbled down a few ideas in my journal, berated myself for my lack of productivity, and scoured my contact list and social media for possible distractions. I have been trying to sit here to write, because I told myself upon waking up that writing must get done. That I am on a deadline. That I have a newsletter to send out and people to email and a business to run. This is what I grew up knowing about production: It happens when you want it to and not when some arbitrary muse arrives. Good girls meet their deadlines. I have to earn the love that I crave by doing a good job – everywhere, all the time, and without fail. And because these have been the stories that fuel me, I have been sitting here beating myself up for six hours. Six hours when very few words have been written. This is what life is like for those of us who forget that contribution is only one of our universal needs. Those of us who wind ourselves up on caffeine to plow through the unending to do lists that lay out before us. Those of us who believe, on some level, that this is the only way forward, the only way to achieve what we want to achieve in this life. But the truth of this moment is that I am tired. That, I could have saved myself five hours of strife if I had allowed myself one hour of uninhibited rest when I ached for it earlier instead of stealing restful moments in between forced productivity. That, this weekend we drove all over creation for the holidays and I had work to do, so I didn’t have an opportunity for the blank space that restores me and readies me for the week ahead. That, I could have chosen to scroll through Facebook five fewer times and stretched for five more minutes. That, today is just one day, but if I do not allow myself to rest, I will still feel overworked and undernourished again tomorrow. That I will be right back here again, in the mess of my old stories about productivity and frustration at my lack of self-care. We were not created to perform around the clock. Flowers do not bloom 365 days a year. The weather changes with fits and starts as the seasons roll into one another. The tide ebbs and flows. These natural phenomenons do not ask for permission to rest. They do not languish their inability to be productive. Instead, they understand the cycle of rest and creation, where rest carves out space for creation and creation expends energy readying us for rest. The cycle of nourishment and production. The model for sustained creation and motivation. Deeper than deadlines. More soul quenching than the fleeting validation of external praise. 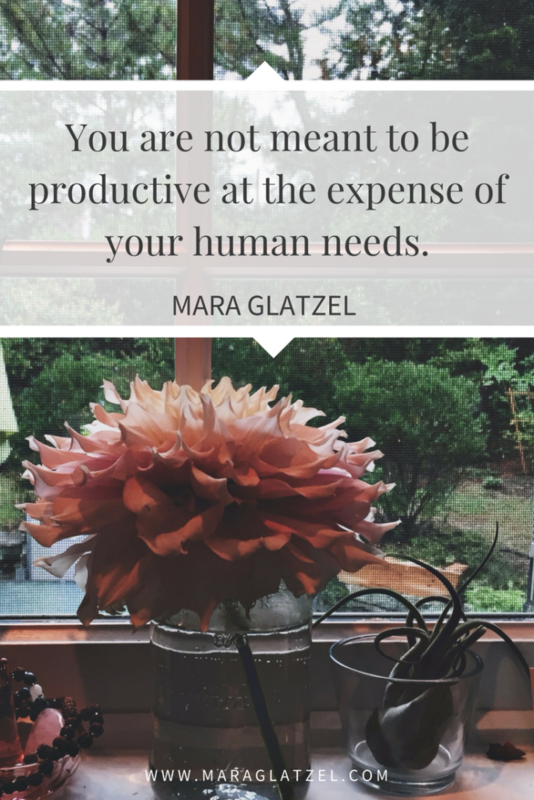 We were not created to be productive at the expense of our human needs. And I’m not even talking about popular notions of self-care. I’m not talking about hot baths and cascading baskets of truffles and adult coloring. (Though they all might be indisputably awesome.) I’m talking about the fundamental needs that your physical self requires in order to keep showing up here each day. Sufficient rest. Time without a purpose. Blank spaces to think without the distraction of devices, TV, music, social media, noise. Adequate hydration. The permission to approach things our own way, instead of the constant inner judgment of our own personal process. The restoration that feeds our creation. The tending that revs us up to get back to work. The way that we feed ourselves not in an attempt to ditch our responsibilities or dodge our work, but in service to whatever it is that we care about most. In service to our work. In service to our own particular ability to contribute to the world around us. What if we didn’t sit at our computers pretending to look busy anymore when what we really wanted to do was to shut it down and come back to it with fresh eyes? What if we closed our eyes for fifteen minutes? What if we took a proper lunch break? What would be possible for us when we returned to our desks, renewed and rejuvenated? I don’t know about you, but I really want to find out.